Friday was a rough night for Buckeye nation, as careless mistakes and sloppy football eventually led to Ohio State’s Orange Bowl loss to Clemson. If you thought it was tough to watch as a fan, imagine how it felt to be one of the players or coaches who let the game slip away. It must’ve been maddening — maddening enough to make you punch something. Like a whiteboard in the locker room . . .
Here’s a closer look . . .
Told the whiteboard was busted pre-game. No one is snitching on the culprit. Either way, we’re not surprised. 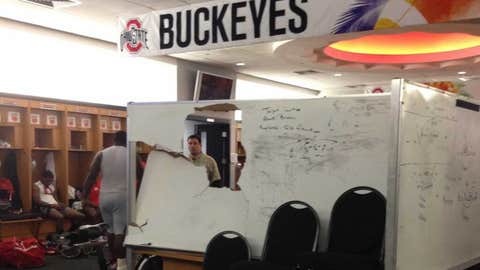 After all, the whiteboard damage is nothing compared to the mess the Buckeyes made of the Illini visitor’s locker room earlier this season.